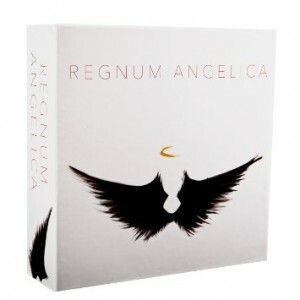 My first review on this site and it’s going to be about the game Regnum Angelica by Black Locust Games. 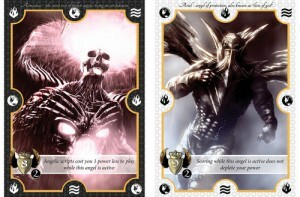 It’s a card game where players pit their Angels against each other in a bid to infiltrate each other’s realms. It’s a very strategic and fun game for two players. I’ve always loved the mythos of angels and demons fighting an eternal war against each other trying to get the upper hand. So when I heard about Regnum Angelica from Black Lotus Games on Twitter, I had to investigate immediately. What really hooked me was the simplistic artwork that governs the box. It’s not complicated or crowded, it’s just a pair of black angel wings with a halo above it. It looks so beautiful and this sort of artwork is carried through all the cards and board. I had to have a closer look, hence why I downloaded the print and play version from Board Game Geek. 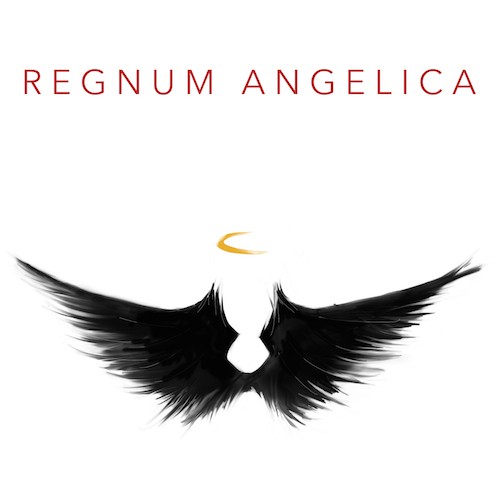 The objective of Regnum Angelica is to score a total of 35 points by moving your angels into the realm of the opposing player. The other end condition is if a player runs out of cards to draw from in their deck. Once this happens, the player with the highest score wins. In my playthroughs of the game, my wife and I have never reached the thirty five points needed to win in the game but that didn’t matter to us. We still had lots of fun. The artwork within this game is stunning. Even on standard paper, the board looks impressive, it depicts the three realms of Hell, Earth and Heaven. Along side each realm are spaces for your draw cards and void cards. On the left hand side is the score track where the players use two tokens to indicate the score (tens and units). On the other side is your power meter which governs your use of scripts (powers) and movement of your angels. All the information that a player needs is on the cards, from the rank/scoring mechanism, the effect of activating an angel and the elements used in combat. Along with the player aid, I very rarely found myself referencing the rule book after the first few playthroughs. As for the other components in terms of scoring and movement meeples that come with the retail version, I just used Lego pieces which did not distract from the enjoyment of the game. Now onto the meat of the review. This game lasts for about 45 minutes although once you are familiar with the rules, it can be shorter. When the wife and I first read the rules and setup the game, we initially thought that this game would play like Batman: Arkham City. In that game, the villians have to move from one side to another in an effort to escape the city. Like Regnum Angelica, the cards are played down and can be flipped over to activate. The difference is that in Regnum Angelica, the inactive (face down) cards cannot proceed up the board. This makes a BIG difference in balance and strategy. At the start of the game, each player has to draw 7 cards. Next, movement cubes are drawn. This mechanic is well implemented as each angel has different movement points which governs how far they can move up the board in one turn. However, the movement tokens are governed by the power meter which only increases when the Angel reaches the middle of the board and lands on the I or II icons. This small detail keeps the game moving at a nice pace. More power = More Movement = More powerful angels can move = Better scoring opportunities. This is a game where you cannot be passive and allow the other player to come to you. If you try this method, then you won’t be able to get the 35 points to win. In fact (as far as I can tell), you won’t be able to gain any points. So you do have to activate your angels and move up the board. What you can do is keep a defensive line and allow the opposing angels to guess what you have placed in your front row. So it really is a gamble for them to attack an inactive angel. When you activate an angel, each card has an effect that comes into play when you flip it over, so in the case of Michael, when he is activated, one point is added to your power meter. Each angel has different abilities, some allow you to score points when other angels get to the other side of the board, others reduce the cost of scripts. In all of the gameplays that I’ve done with Regnum Angelica, at no point did I feel that I was unfairly beat. The game was balanced for me. Everything is literally laid out on the table. You can plan ahead because you can see what is coming. You look at your hand, check your angels, pillars or scripts and then place them down and hope that your opponent would do the same thing to you when it is their turn. The tension mounts as you pull off the combos and your angels race up the board only to be stopped at the last moment. What could be simpler than a rock, paper, scissors mechanic for resolving combat? Huh, what? Infinity? – Yes, on a few select cards, namely the top dogs (Gabriel and Beelzebub), their compass is comprised of the infinity symbol. Which means that they can beat each other in combat as they both neutralise each other. The other way to banish these two top dogs is by the use of the Exile script. As the angels get into position around the board and meet each other, the cardinal point that connects the two cards is the element that gets compared. And that’s it in a nut shell. The only two caveats to the resolving of the combat is if an element meets another element, then they are tied. Once they are tied, then the score/rank of the card comes into play and the highest ranking angel wins. However, if they are both ranked equally, then they destroy each other on the battlefield and are banished to the void. Sounds simple, not quite – Another element to combat is the use of pillars. Provided that a player has enough power, they can assign a pillar (or shield) of a certain element to provide an extra layer of protection. If an angel meets a shielded angel, then the pillar has to be resolved first and destroyed which leaves the attacking angel potentially vulnerable. You can see how you really have to think ahead and plan how you are going to attack and with whom. That’s pretty much it in terms of the game. It’s a nicely paced game where you’re moving angels up and down the board. You have to manage your power meter carefully (which resets after you score) and you get to drool over beautiful artwork. The social interaction between players could be a case of ‘stare at cards, look at board, play cards, your turn’. It is a lot of fun and you will enjoy yourself and come back for more. As I’ve said at the beginning of this review, I love this game and the fact that I didn’t even know about it until I saw it on Twitter, meant that I had to check it out. I went to BoardGame Geek, read the backstory (always a sucker for a good story/lore), drooled over the artwork and downloaded the Print and Play version. I’m so impressed that this game is on my wishlist of things for Santa to bring this Christmas. The gameplay is good, it ticks along at a decent pace. The rules are simple to understand and combat is easy to resolve. After a while, we didn’t need the movement meeples as we could look at the power meter, see what angels we had on the board (maximum of 5 per side) and figure out what we needed to do. The player aid helped immensely. It must be good as the wife said that she would love this game, she would play it again. That is a good recommendation, when it comes to board games, she’s a hard woman to please. So what rating would I give this? Posted in Print and Play, Reviews and tagged PnP, Print and Play, Review. Bookmark the permalink.